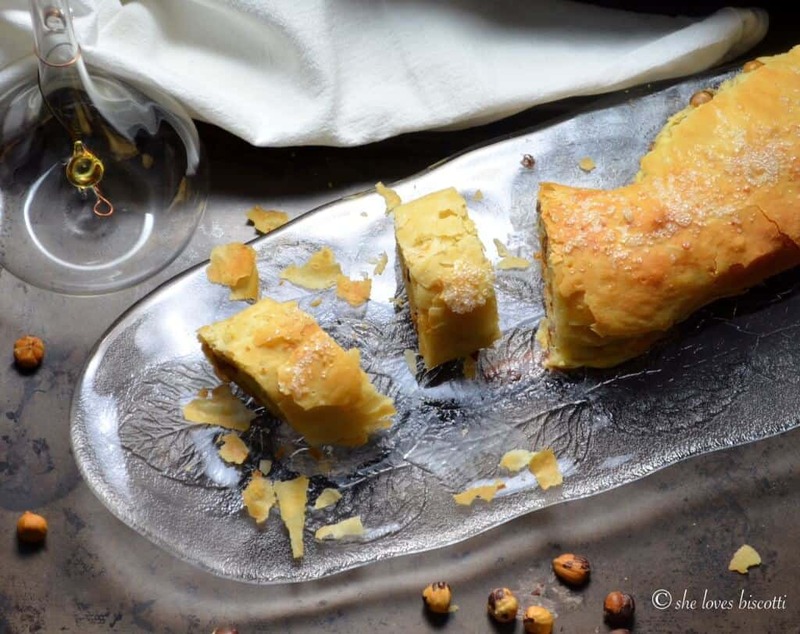 Simple Italian Ricotta Cheese Strudel… Ambitious? Most definitively. Challenging? I thought so. Grateful to have made it? Absolutely and on so many levels. Intrigued? Come and take a look at this collaborative effort with fellow Montreal blogger Kim from The Finer Cookie. A few months ago, Kim messaged me with a proposal that I just could not refuse. 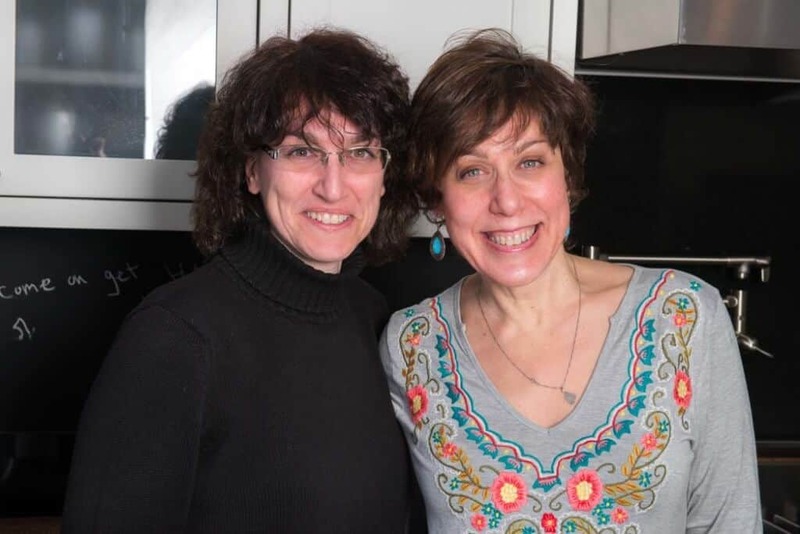 I met Kim back in October, when I participated in my very first Food Blogger Conference (if you are interested, you can read about it here). The general idea was to work together on a recipe. After a few brainstorming sessions, we decided that we were going to use one filling, i.e. a ricotta cheese filling, and try to achieve two different looks. I was going to attempt to use the filling in a classic strudel dough, whereas Kim, being more adventurous, was going to use phyllo dough. Once we decided our plan of action, I was extremely excited to get started. And as they say, the rest is history. Up until a couple of weeks ago, I had never made a strudel before. If you know me, you know that I will rarely give up an opportunity to have a piece of strudel. But let’s face it, there’s a big difference between making it and eating it. To be honest, I was a little apprehensive, but I was up for the challenge. So, I researched the technique of making strudel and settled on trying a recipe where the dough is stretched paper thin. The recipe for the dough is pretty straightforward. However, what intrigued me about this recipe is that you have to literally slam the dough against your wooden board about 100 times. The first time I made the dough, both my husband and daughter hurried into the kitchen wondering what I was up to. Once this process is complete, the dough needs to rest for a couple of hours. During this “rest” time, the ricotta filling can be prepared. Now for the fun part! You need to cover your kitchen table with a clean table cloth. 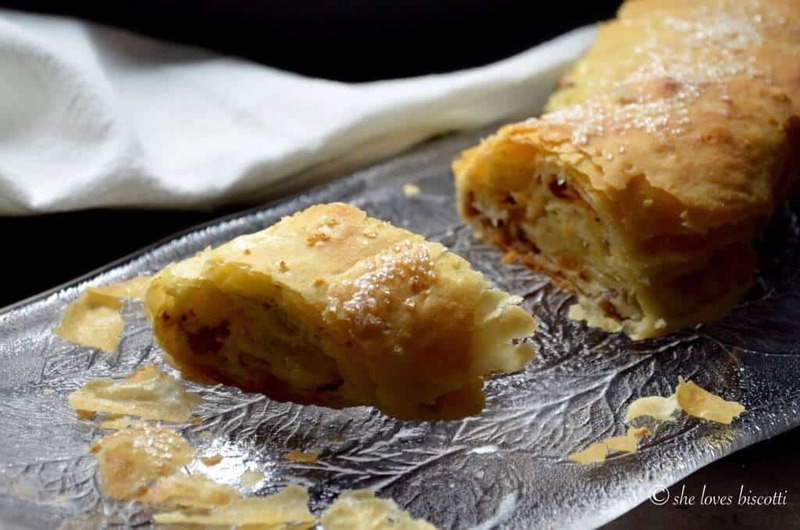 Believe it or not, you are going to use the tablecloth to roll your strudel. Sprinkle the table cloth and your dough generously with flour and begin to roll out your dough. 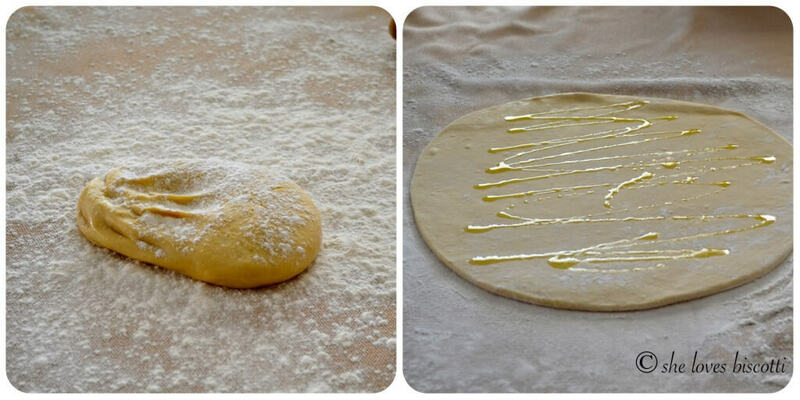 Once it has been rolled out as thinly as possible, brush some oil on the surface of the dough. This will prevent the dough from drying out while you are stretching it out. Are you ready to be amazed? Make fists with both your hands, get under the dough and stretch the dough. Keep pulling and stretching the dough, focusing on the center part. Continue to gently pull and stretch the dough. Once the dough reaches the entire surface of your table, try to anchor the dough on the side of your table. You will notice that the ends are a little thick. These can be cut off once you are finished stretching the dough. Let the dough air dry for about 5 minutes. After which sprinkle and brush some melted butter over the entire surface. I have to say the first time I tried it, I did not put nearly enough butter… but you know what they say, practice makes perfect. Spread some freshly made bread crumbs, followed by the ricotta filling on the top part of the dough, fold over about 3 inches of dough and start rolling with the help of the table cloth. Transfer your strudel on a large baking sheet. Brush a little more butter on the surface and poke a couple of holes. This will prevent your Simple Italian Ricotta Cheese Strudel from bursting. Bake for at least 45 minutes. 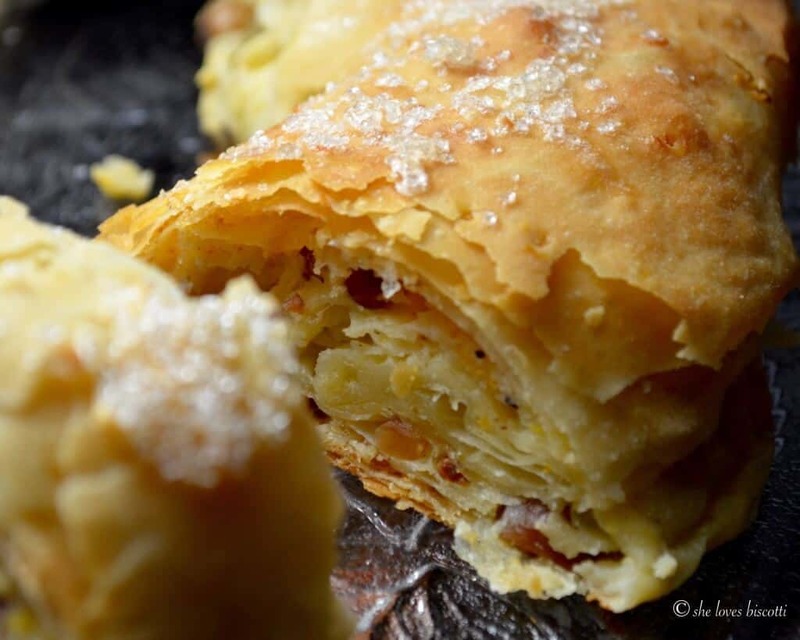 Voila… you are ready to serve your Simple Italian Ricotta Cheese Strudel! 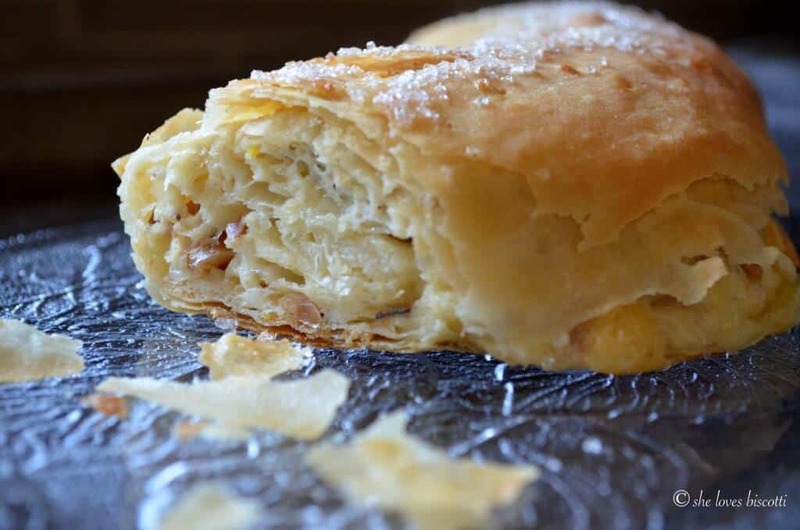 As you can probably guess, there are two parts to this simple Italian ricotta cheese strudel-the ricotta filling and the actual dough to make the strudel. Kim graciously volunteered to create the ricotta cheese filling. Wait until you taste it! The ricotta is perfectly sweetened and flavored. I am extremely grateful to Kim for creating such a wonderful filling and so will you. I snuck in a pinch of cinnamon in my filling because I love the combination of cinnamon, nutmeg and ricotta. 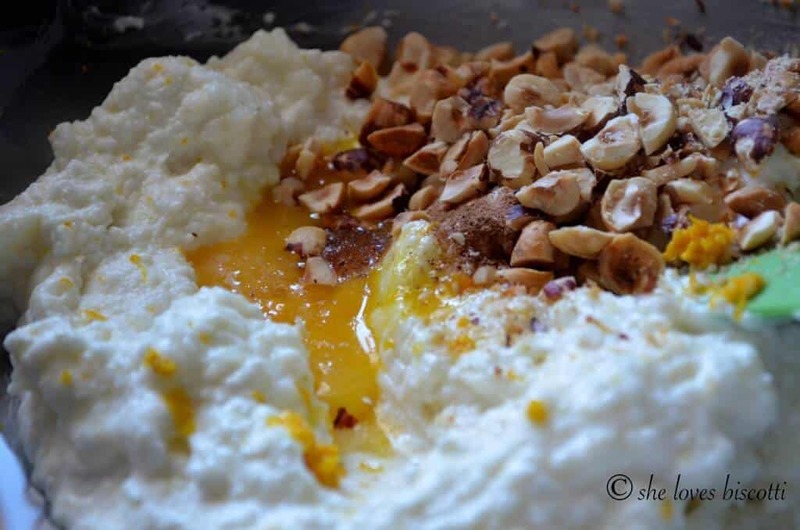 (If you’re interested, I made a short video on how to make your very own creamy homemade fresh ricotta cheese -just click on the highlighted text). The recipe for the dough was adapted from one of my favorite pastry chefs, Nick Malgieri. If you follow this link, you’ll be able to see just how thin this dough can stretch. Since one of our objectives was to create two totally different desserts, but with the same filling, I would invite you to jump over to Kim’s site to admire her Ricotta Hazelnut Strudel Bites. 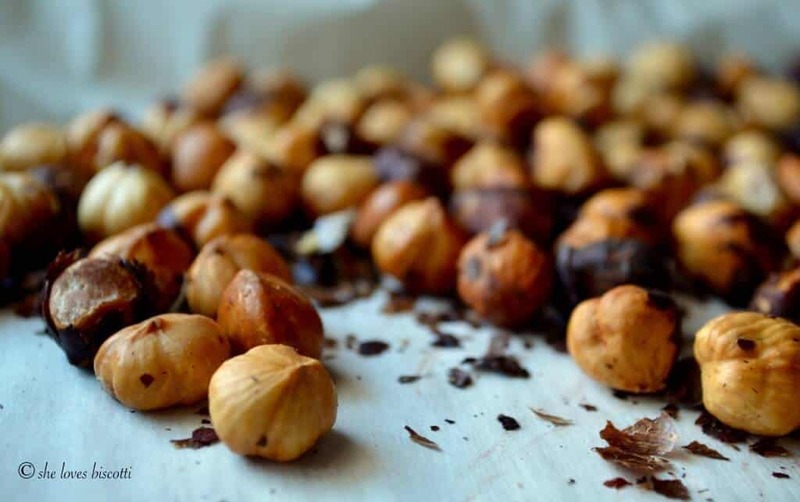 I can honestly say that they taste as good as they look, and I think you’ll agree with me…they look great! Once you set your eyes on these little pockets of deliciousness, I am sure you will want to include them in your Easter baking. Speaking of which, Easter is only two weeks away and I have a few more recipes that I really want to share with all of you. I hope you’ll come back and visit! You can also easily sign up for my updates! 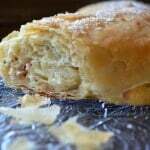 I had an absolute wonderful time making this recipe for a Simple Italian Ricotta Cheese Strudel. Thanks Kim! It was great collaborating with you!!! For your next large gathering, this recipe for a Simple Italian Ricotta Cheese Strudel is always appreciated whether served for brunch or dessert. In a large mixing bowl, whisk together flour and salt. Set aside. In a 2 cup measuring cup, place eggs, oil and enough warm water to reach the 1 1/4 cup mark. Beat lightly together with a fork. Add to the flour and stir together. 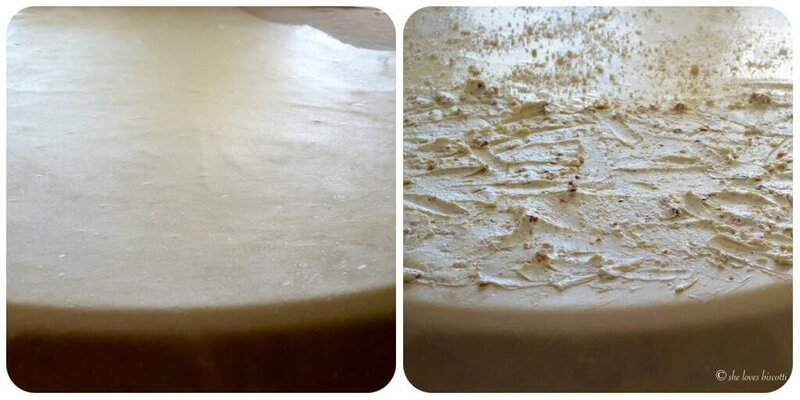 Turn over on a wooden board and knead together for a few minutes. Slam the dough on your wooden board about 100 times. According to Nick Malgieri, knead the dough 15-30 seconds every 20 times you slam your dough on the wooden board. Use 1/4 cup fo flour to prevent dough from sticking to board. Place dough in a small bowl which had been lightly greased with vegetable oil. 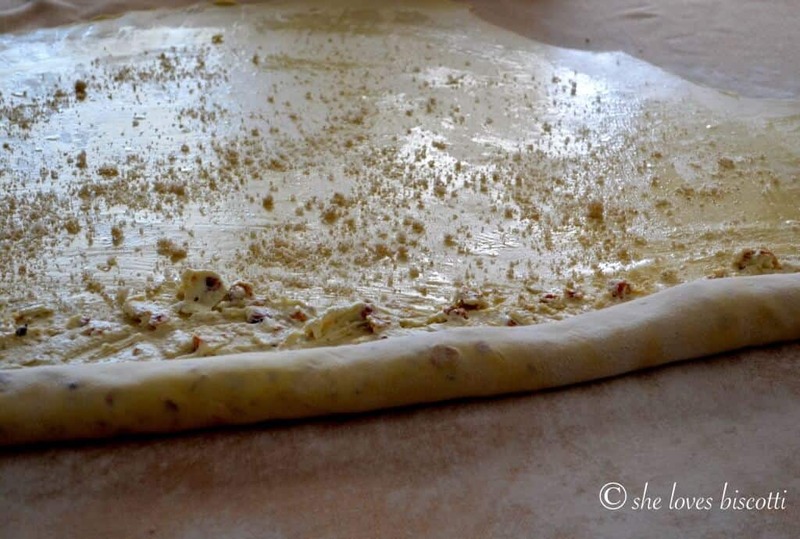 Make sure to turn over your dough so that the entire surface of the dough is greased. Cover with plastic wrap and let rest for 2 hours. Prepare the ricotta filling while the dough is resting. Simply combine all the ingredients in a medium sized bowl. Cover your kitchen table with a clean table cloth..
Sprinkle the table cloth and your dough with flour and begin to roll out your dough. Once it has been rolled out as thinly as possible, brush about 1 tablespoon of oil on the surface of the dough. (This will prevent the dough from drying out while you are stretching it out). Make fists with both your hands, get under the dough and pull the dough. Keep pulling and stretching the dough...focusing on the center part. Continue to gently pull and stretch the dough. Once the dough reaches the entire surface of your table, try to anchor the dough on the side of your table. You will notice that the ends are a little thick. These can be cut off once you are finished stretching the dough. Let the dough air dry for about 5 minutes. Sprinkle and brush most of melted butter over the entire surface (you need about 1-2 tablespoons to brush over the surface of the rolled strudel). Sprinkle the bread crumbs over the entire surface. Spread the ricotta filling on the top part of the dough; fold over about 3 inches of dough and start rolling with the help of the table cloth. Transfer your strudel on a large baking sheet. Brush the rest of the butter on the surface and poke a couple of holes throughout the strudel. This will prevent it from bursting. Bake for at least 45 minutes in a preheated oven at 350 F.
The dough needs to rest for about 2 hours. I’m going to give the strudel dough a try. Thank you. I’ve tried a different recipe (similar to one I remember my mom using) and it just didn’t stretch enough. My mom’s did not have eggs in it … just flour, water and oil, so that’s what I was looking for. I agree with your comment about the butter…your mom’s strudel must have been amazing. The video link I included in the post really helped me visualize the stretching of the dough, but I guess you experienced it first hand 🙂 Anxious to hear how it turns out for you. Oh my gosh, this recipe looks amazing. Crust looks so amazingly flaky and can’t wait to try it. Hi Sonia and mom! You are too funny…and very sweet 🙂 Thanks for your support. Have a great day you guys !! !